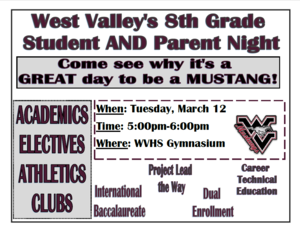 "Please join us for our annual West Valley High School Open House. 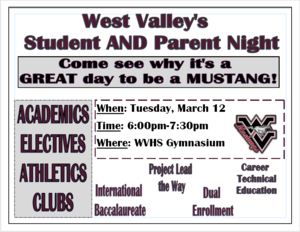 The event will be held in the gymnasium from 6-7:30 pm on Tuesday, March 12. This is a great opportunity to meet your student's teachers and discuss their academic progress. We hope to see you there!"